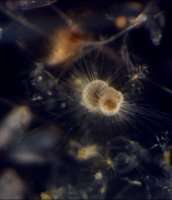 (PhysOrg.com) -- Scientists studying the fossils of tiny ocean-dwelling plankton, called foraminifera, have uncovered another piece in the puzzle of why species evolve or become extinct. The issue of whether extinctions and evolution are controlled more by the environment or by the existing diversity of species in an ecosystem is one that scientists have been debating since Darwin's time. Writing in the journal Science on Friday 15 April, researchers from Imperial College London and Cardiff University say their study of foraminifera, or forams, suggests that new species are more likely to evolve when there are fewer species already and that extinctions are more closely linked to a change in environment than they are to the number of existing species. Forams are marine plankton measuring not more than half a millimetre across, smaller than a grain of sand. They are abundant in oceans the world over, where they have existed for over a hundred million years. When forams die, they sink into the seabeds where they accumulate in layers many kilometres deep, providing a largely unbroken record of their history. They have distinct shells made from calcium carbonate, similar to the shells of snails and birds' eggs, which can tell scientists about the environment in which they lived. For these reasons forams make excellent subjects for studying changes in environment and evolution. Advanced techniques in geochemistry and microscopy have allowed the scientists to interrogate the foram fossil record in greater resolution than ever before. This enabled the researchers to model the interactions between the diversity of different foram species, the climate and the species' ecology over time, in order to see what factors had the greatest impact on the species evolution. By looking at the shells under a microscope and using information derived from chemical analysis of the shells, the team was able to make interpretations about the environments the foraminifera were living in; for example, whether they lived in the surface waters and hosted even tinier photosynthetic organisms or whether they lived hundreds of meters down where the light and heat from the sun was greatly reduced. Professor Andy Purvis, from the Department of Life Sciences at Imperial College London is a lead author of the study. He said: "Newly obtained paleontological data about forams and the environmental conditions they endured are only just starting to yield valuable information about how life has changed form and function over time. This work is another step towards improving our understanding the complexity of extinct ecosystems and could help scientists predict future changes in modern biodiversity." Tracy Aze, co-author on the study and a PhD student in the School of Earth and Ocean Sciences at Cardiff University, said: "The fossil record is a critical resource for understanding how today's species might react to our changing climate because it is the only way to study evolution's winners and losers." Co-author Dr Thomas Ezard, now at the Department of Mathematics at the University of Surrey, devised a mathematical framework to analyse the interactions of species diversity, climate and species behaviour whilst at Imperial College London. He said: "The richness of the foram fossil record lends itself ideally to detailed mathematical and statistical modelling. This richness provides us with the robust evidence we need to make predictions about how complex interactions drive evolutionary dynamics." Dr Ezard concluded: if we want to understand evolution fully, we need to acknowledge that not all species are one and the same. The astonishing abundance and diversity of these foraminifera provides crucial clues in awkward parts of evolutions puzzle. The problem for scientists is that the uniformitarian assumptions which form the basis for the Earth sciences today is oftentimes in contradiction to the observation of evidence for repeated catastrophe. That there are enigmatic, highly coincidental accounts which permeate human mythology (the "creation myths") strongly suggests that these catastrophes have persisted into human historical times. Adam and Eve may have merely been the two sole survivors of the last catastrophe. While scientists have successfully thwarted Immanuel Velikovsky's "proofs" for recent catastrophe, they have not one bit undermined the view that catastrophes are common, and very possibly instrumental in creating giant structures like the Grand Canyon. After all, why does the Colorado River punch straight through the Kaibab Upwarp plateau? Rivers tend to go *AROUND* impediments -- not through them. It's as if the Grand Canyon fell from the sky. If the human population was brought down to two individuals humans would be extinct within a VERY few generations. (inbreeding). I know it was not mentioned, but the great flood that supposedly happened as well never seemed to be recorded by the Egyptians. While it seems myths can SOMETIMES explain actual things that happened, more often than not, they do not explain things that actually happened. 1. The genetic code is deficient and full of damage - as it is today. 2. The environment is such that it cannot support the requirements for a healthy genome - as it is today. In the garden of Eden, things were different - physical perfection existed - and it persisted stubbornly even after the fall of man. Which is why biblical characters lived so long in Genesis. Only after the flood did things really go downhill fast. But then, you don't believe these myths. You DO realize that whilst you are so ardently critical of creation you are ALSO describing evolution here, don't you? Evolution [as in the one-ancestor story]is a myth of devilish proportions. Are you saying that damaged offspring due to inbreeding is a result of damaged and deficient DNA in the parents? Please explain. Keep in mind that these "deficient" parents can produce offspring that are just fine if they don't inbreed. You appear to be saying that DNA changes from generation to generation? If so, this is a fundamental leap for you. Do NOT downplay this. This is incredibly significant! Are you publicly stating that you believe that DNA can and does change from generation to generation? 1. Do you have evidence for this garden of Eden? 2. Do you further have evidence that there was "perfection"? 2a. How do you define "perfection"? Again, where do you derive this information? Please inform us all. Which flood? Or are you talking about the world-wide flood? Try to gain some credibility and answer the question: If there was a worldwide flood, why didn't the Egyptions notice? WHEN was this flood?... for the 100th time! But then, you don't believe these myths. I believe kev is evolving an doesn't know it. Here's one of the many problems I have with a 6 day creation only thousands of years ago: If the universe were created only thousands of years ago, why can we see see objects BILLIONS of light years away? I know you won't answer that because I've asked it countless times and you disappear from the thread 100% of the time, like you will disappear now.